The Libby Loggers American Legion baseball team plays at Lee Gehring field located off of West 2nd Street. The concession stand at the field is also used by the Libby Volunteer Fire Department for training. 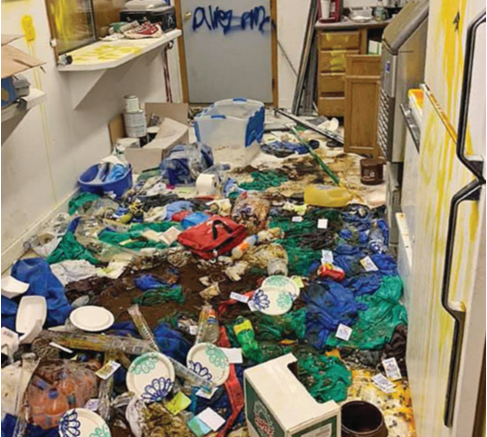 On Sunday, March 31 volunteers discovered a huge mess (pictured below) and what appeared to be an attempted arson at the concession stand. Two hours after the post was shared on Sunday afternoon, it had received 636 shares in a flood of community support to help find the looter. The post also had over 150 comments, primarily offering condolences but also offering to help with monetary donations and volunteering. Responses were so supportive that a GoFundMe page was subsequently created to accept donations. Anyone interested in donating can follow the GoFundMe link on the Libby Loggers Baseball Facebook page. The page raised $250 within for first half hour of being started. Donations can also be sent by mail to Libby Loggers Baseball at PO Box 1528 in Libby, or they can be dropped off at Libby High School, Fjelstad Accounting or Foss Chiropractic. Donations are tax deductible since they are a 501(c)3 nonprofit organization. Lee Gehring Field draws hundreds of people into Libby throughout the summer with a six team Wood Bat Tournament in May, another tournament during Logger Days, and this year, they will host the 2019 Western A District Tournament in July.